If you remember last Tuesday, you'll recall that I had posted my debut announcement for this "Test Kitchen" concept I would be trying out. 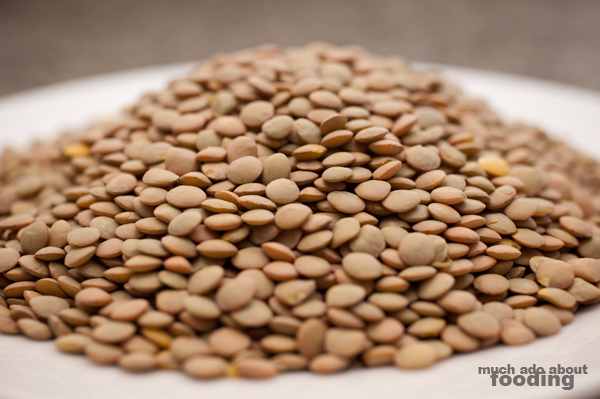 Basically, I'll reveal an ingredient and work off of your suggestions on what to make with it (suggestions collected on Facebook). The inaugural test kitchen ingredient was the orange habanero pepper. A daunting thing to work with but even more daunting was the technique I chose to go with; so, not only did I learn how to work with this new ingredient, I also learned how to can! 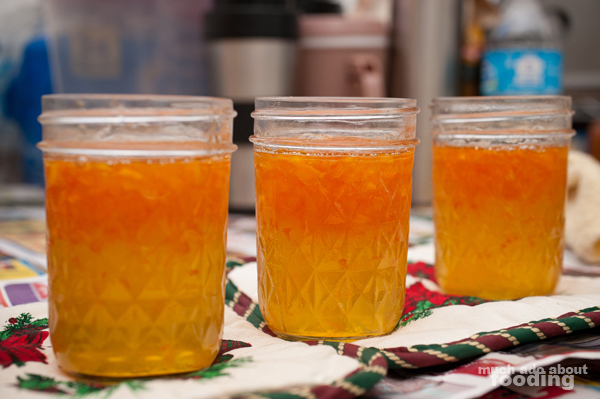 The jelly came out well so I hope you enjoy this recipe that was modified from this link here! I have never canned/jarred before and was really thinking of not doing it BUT the price was right, so I bought myself the equipment. 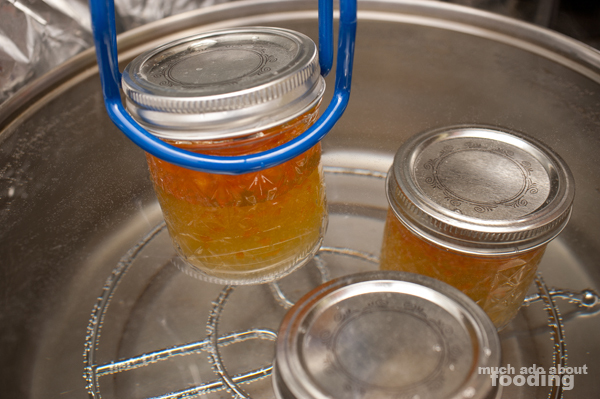 The important thing with canning is sterilization - follow manufacturer's guidelines for preparing your jars and lids (usually simmer jars in a large stockpot and lids & rings in another). 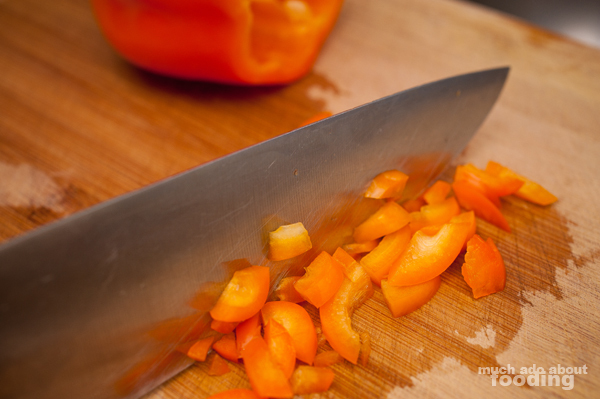 For ingredients, chop up your bell pepper finely. When handling habanero peppers, it is highly recommended to use gloves. For this recipe, you don't need to if you are careful with your hand placement. I just cut off the tops of the peppers. You may choose to just cut slits into the peppers. The purpose is to expose the pepper oils into the jelly. In a large saucepan, bring all ingredients to a full rolling boil over a medium-high heat. You'll start to noticing the mixture becoming more jelly-like. Continue the boiling for another 5 minutes or so, making sure to keep stirring to avoid burning. 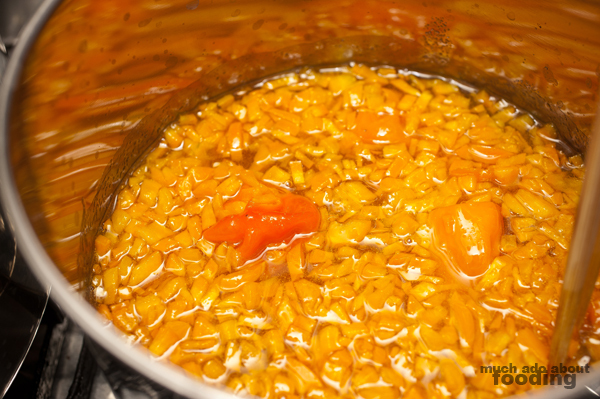 Remove the saucepan from the heat and discard habanero peppers. 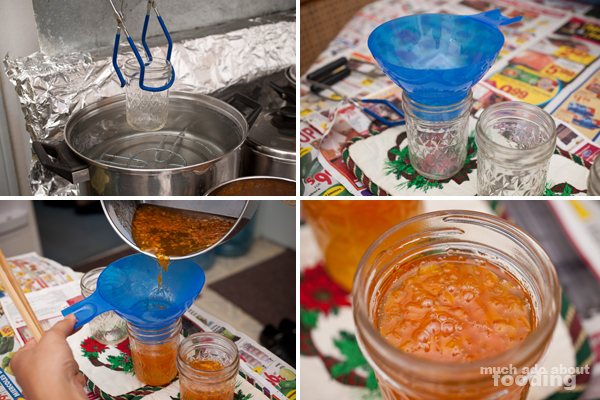 Pour the jelly into your sterilized jars (with a funnel) and leave 1/4" headspace. Wipe rims cleanly and put on lids & rings tight enough to allow no water to seep back in. 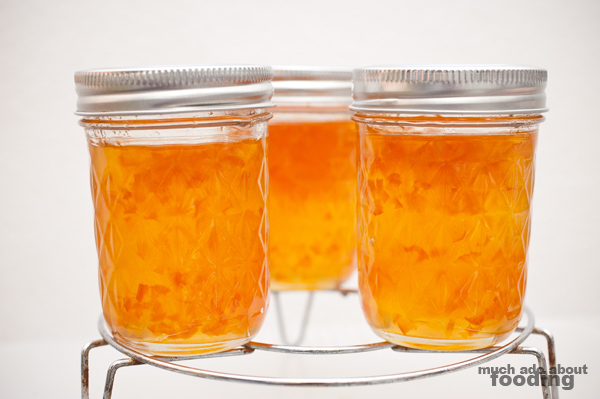 Place jars back into your stockpot or canner and boil in water for 10 minutes. Using tongs, remove to a rack to cool and set. Jelly setting may take up to 24 hours.